IREM Human Resources Digital Publications will help you expand your skill set and provide resources for every step of your career development. No matter your level of experience and expertise. Whether you’re starting your own firm or want to grow an established business, this third edition of Business Strategies for Real Estate Management Companies will show you how to attract and retain clients, market your business more aggressively, expand the services you offer, and boost your company’s profits in today’s changing business climate. 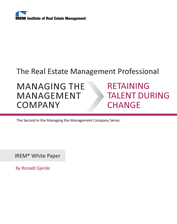 This new edition also features six case studies of real estate management companies in their infancy. It provides an inside look into the trials and tribulations that you will likely encounter, along with tips and lessons learned. 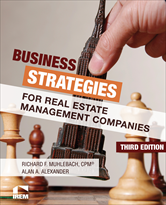 Business Strategies for Real Estate Management Companies provides guidance and insights for many situations that, along with your personal experience and knowledge, can help you take advantage of the opportunities and meet the challenges of the present and future. If you like this white paper, you may be interested in the other papers in this series. For additional white papers feel free to access our papers on leadership. The most common competency listed for virtually all job descriptions is good communication. It's not surprising, then, to find that is was ranked the second most important competency for real estate management professionals. While the ability to effectively communicate with others is critically important, it is one of the toughest skills to master - especially since the meaning of any communication is determined by the person receiving it and not the person giving it. As a result, the same message can have a different meaning to different people. Have you ever sat in a meeting and then talked to someone afterwards who had an entirely different interpretation of what happened in the same meeting? It's a pretty safe bet that if you can communicate effectively, you probably can't do your job very well. Fortunately, we can all improve our communication skills, ensuring everyone receiving our message gives it the same meaning as intended. The Leadership Development: Communications white paper can assist you in improving your skills. The white paper on recruitment and hiring helps you take a leadership approach by stepping back to reassess your current hiring and staffing process. How much time do you spend on hiring staff? More importantly, how much time do you ultimately save by hiring someone who is a great fit for the job and for your company? This white paper on recruitment and hiring helps you take a leadership approach by stepping back to reassess your current hiring and staffing process. Not only will this allow you to hire the best talent, but you’ll be able to reconsider any non-performers at the same time. As a real estate manager, you are often busy taking on greater (or different) responsibilities. As a result, when we’re trying to fill an open job, you may tend to look at the person, rather than the position you want to fill. Understand the key principles that are crucial for your company and how you can recruit the best people for you team—and for your culture. Think about what’s already embedded in your corporate culture, and what you would like it to look like in the future. Download this white paper today to learn the answers to five essential questions. If you like this white paper, you may be interested in the other papers on leadership. For additional white papers feel free to access our papers on leadership. Did you know that employees affected by change initiatives at work are three times more likely to leave the organization within the next year compared to those who haven’t been affected by organizational change? Did you also know that the stress, fear, and negativity that employees experience during change is also a leading cause of change initiative failure? If an organization doesn’t embrace change, it is most likely on a death march. But poor implementation of change initiatives can result in both failure and in the loss of good talent. Before your next change initiative takes place, learn what you need to know to be successful while also keeping your good talent on board. What are you and your real estate management company doing to reduce risk and maximize future relevance? One of the biggest threats to every real estate organization is the sudden or unexpected loss of a key leader. In fact, 40 to 60 percent of Baby Boomers currently employed are likely to retire or reduce their full-time workload. As a result, the real estate industry is verging on a sea of “flash” retirements. When those sudden retirements, unexpected illnesses, or resignations occur, there is limited time to transfer knowledge, relationships, and unique skills. In the words of Christopher Lee, “Succession planning is not an option, it is a requirement.” Whether you are working in a large organization, mid-sized company, or small firm, you need succession planning. 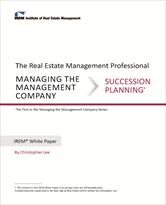 Get the conversation started and help prepare your real estate management firm with a solid succession plan. 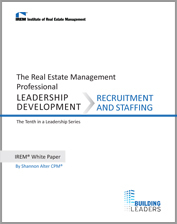 The content in this IREM White Paper is an excerpt from the IREM publication, Transformational Leadership in the New Age of Real Estate (2012) written by Christopher Lee. 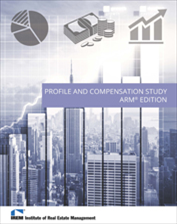 Using the detailed comparative data provided in this study, you can analyze your compensation and benefits and discover the ARM advantage! For the first time, both U.S. and Canadian content is included. What does earning a designation mean for property managers? Higher compensation? Bigger bonuses? Better benefits? According to the Profile and Compensation Study, CPM Edition, the answer to these questions is a resounding YES! Available only in eBook format. If you would like to purchase a printed copy, click here. A practical guide that provides the know-how to develop and manage your real estate career so you achieve the results you want. 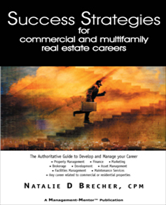 Interviews of successful real estate practitioners, along with the author's experience, provide the knowledge, ideas, and plan to create career success! for you. Prepare an actionable plan to achieve your career goals! Ever wonder, or been asked, what do property managers really do? Over 1,400 members of the real estate management profession helped answer that question. 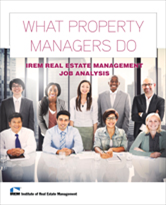 If you are curious about what those professional told us, you can find it in “What Property Managers Do: IREM Real Estate Management Job Analysis”. In addition to learning what real estate managers do, you will also find out what special knowledge they need to successfully perform their tasks and duties.